I'm excited to be part of the Quick & Easy Quilts blog tour. As soon as I received my copy I sat down and spent time admiring the 20 beautiful projects. I even made notes on which ones I want to make and which fabric I would use! I really love Lynne's style and have followed her blog Lily's Quilts for as long as I've been quilting. The projects in the book are all beautifully photographed by Jan Baldwin and there are great illustrations by Bess Harding. It's really helpful to have pictures and diagrams, it makes the instructions so clear and I like seeing full photographs of each finished project. 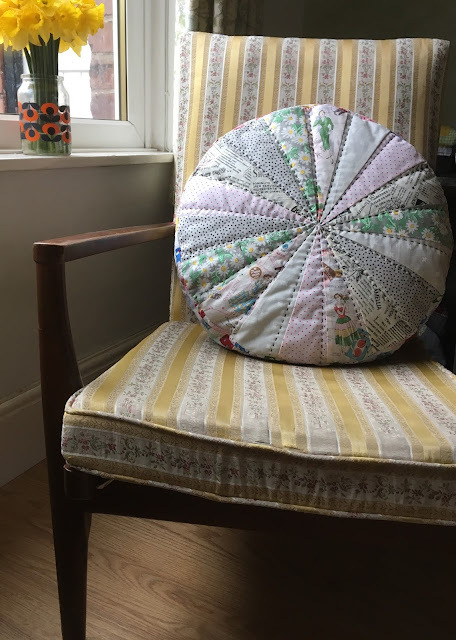 I was so inspired and just had to make the 'Gypsy Cushion', it's a good size at 17" and there's something so homely and pleasing about a circular cushion! The book helpfully contains full size templates, I'm often put off other patterns by the thought of having to mess around enlarging templates, and it meant I could start sewing right away! I made a photocopy of the template, cut it out and glued it to thick card so I could rotary cut all the wedges. The hardest part was thinking about the direction of these fussy cut vintage ladies. I added some hand quilting with black perle thread and used a cheater patchwork print for the sides and back. The instructions are really clear and it was quick to make! 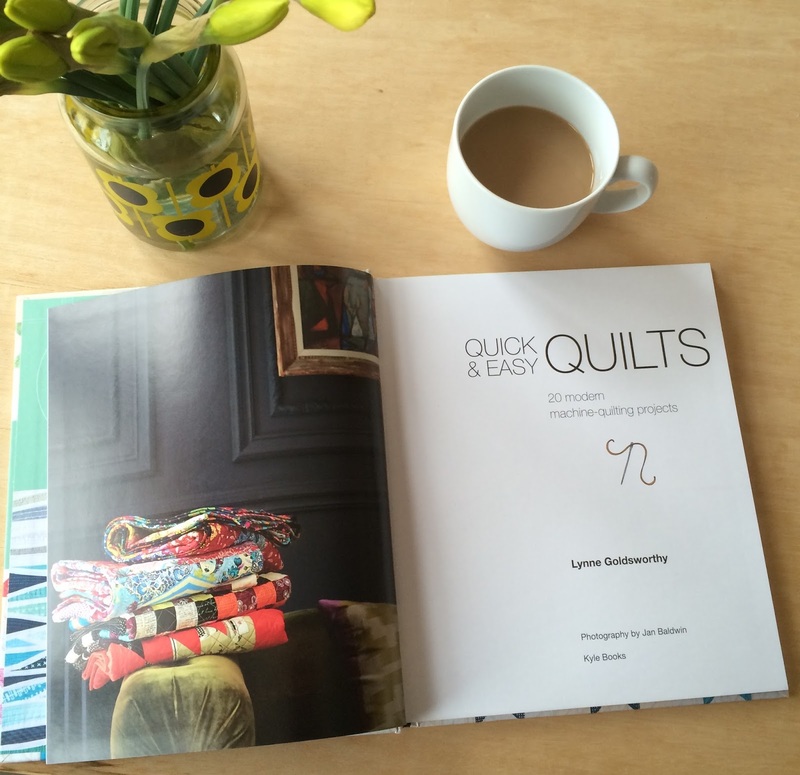 Lynne is an experienced quilter, the 'Equipment and Materials' and 'Techniques' sections of the book are excellent for beginners and there are tips for quilters of all abilities. It is definitely a book written by a quilter for quilters and Lynne has created 20 gorgeous projects that you will want to sew. The 'Under My Umbrella' quilt is next on my list. I think the publishers Kyle Books have done a fabulous job too - as a book lover I really like the textured cover, the fact it is hard back and the way it's been bound means that the pages easily lie flat, a big bonus when you're following a pattern! 1. Leave a comment on this post - if you're stuck for something to say tell me what fabric line you'd use to make the Gypsy Cushion. 2. Share this post on social media and let me know in a separate comment. The giveaway is open internationally, it will end on Monday 18th April and the winner will be chosen by random.org. Good luck and to check out the other stops on the blog tour click here! I love to alternate quick and easy projects with longer projects. I would LOVE this book, thanks! 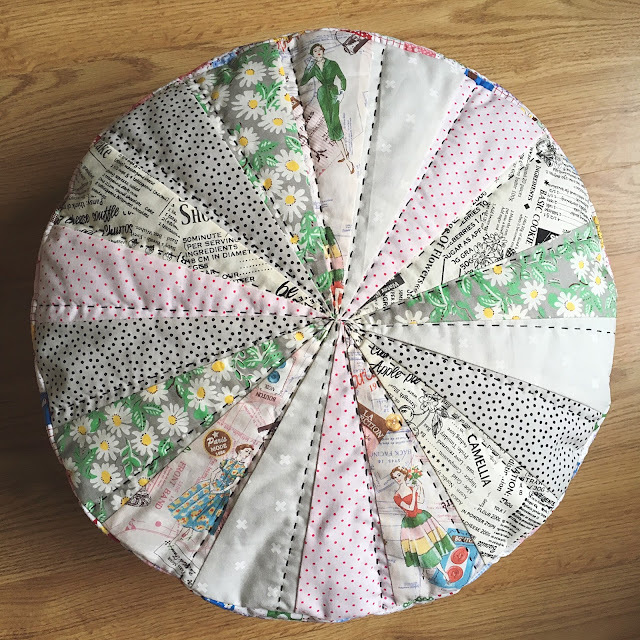 I would love to make that gypsy cushion out of scraps - I need a scrapbuster project right now! I wonder if I would use my new fabric by Sara Jane it might be a little pale for our front room, but if I win I might try it anyway. Thanks for the chance to win. Such a lovely book! Id make the cushion in Carolyn Friedlander fabric as those lines are all I can think about currently ;). Thank you for the chance to win! NEAT PILLOW PROJECT! THANKS! I'D LIKE TO USE "AMBLESIDE" FOR MY PILLOW! I would use my pink fabrics and make the cushion for my Granddaughter. Oh I adore the fabric youve used for the cushion, its a lovely looking pattern and I would very much like to make it too! I have some greens and blues lying in waiting for this. Then I'll just have to make a bigger border around my blue/greep wip! Sounds like a gret book and your cushion is so pretty. I would use some plaids to make a cushion for my husband and some Univ of Kent fabric to make one for my grandson. I really like the way your pillow came out and the way you used a cheater on the side. Thank you for the comment on how the book lays open flat when you are working on a project. I am always having to find something to weigh books open or to clip pages so I can easily find my place. I love quick and easy so this book would suit me well. Cushion is super cute. I have a number of large scale print scraps to cut up for cushion. I could really use this book with my stash! I am very into making cushions right now and this one is gorgeous and quite different. I would make mine out of Kaffe Fassett fabrics. Love the big stitch quilting. Would love to win this book. Thanks for a chance. thats a cute cushion, and I like the black perle stitching, it gives it some oomph! Thanks for the giveaway, I would use a Riley Blake line for the cushion, as their fabrics are a bit thicker than the AGF fabrics I usually quilt with. Something bright and cheery. I have some Liberty the would look beautiful as a round cushion. Thanks for the chance to win a copy. I think Paisley and Polka Dots would be a perfect choice for the cushion. deeh494@gmail.com. I would use Lavish from Art Gallery. Thanks! Love the low volume fabrics I see in this post --especially the Gypsy pillow. The book looks like it would be full of inspiration. I think a mix of Tula Pink fabrics would be fun, this book looks great! i would use batiks for the cushion, yours is very pretty and homey. Love this book!!! I would make the cushion with Bee Creative. I'd love a copy of Lynne's first book! I remember when Lynne was new (and undiscovered!) and we all made these circles reminiscent of your Gypsy cushion! I can't remember the name but it was wild and we had such fun with it! Then it morphed into the Dresden QAL.... She is a clever girl, that Lynne! The Gypsy cushion is a great way to show off the fabrics. Cute design! Love your cushion and the hand quilting. Thank you for the inspiration and the giveaway. Beautiful cushion.I` would make one with solid fabric and prints and sure one would be green. Your cushion is beautiful Lucy - I would like to use some Carolyn Friedlander fabrics to make it. Great Gypsy cushion!! I have lots of 1930 fabrics repro fabrics and I would love to make one w/ that! Your Gypsy Cushion turned out really cute. I think the book would be a wonderful addition. Love the cushion! Id love to make one. Would LOOOVE to win this book! Thank you for the chance! :) I would make the Cushion in "Prairie"!! There are definitely times when a Quick and Easy pattern is perfect and greatly needed! I'd be sure to put this book to good use for these times! The book likes a great addition to inspiration. Your cushion is fun;I would love to make one in batiks. Thanks for the detailed review of this book. I am with you--I really appreciate the thoughtfulness that went into designing this book, such as making it lie flat, and providing full-size templates. I live in a rural area, and make copies on my old home copier, which doesn't have the ability to enlarge things, so when patterns need to be enlarged, those patterns have to be set aside until I am driving into town, which is always disappointing. You know how it is--I want to get started now! 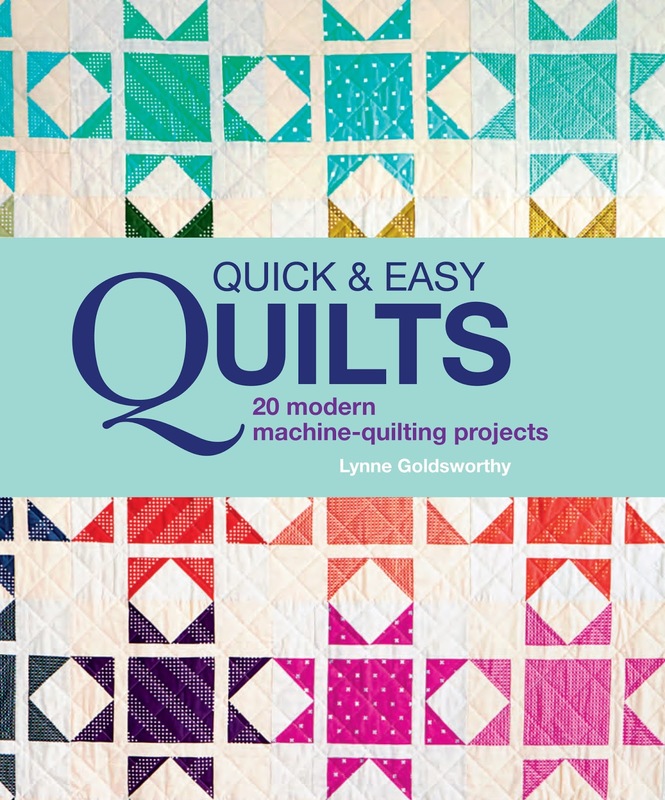 I'm not surprised to see that Lynne G. put so much thought into this book, though, because she strikes me as that kind of quilter. Thanks very much for the chance to win a copy of her book. I shared this on Twitter, where I am @wordygirl11. I want to make two, one for each of my cats. I would use Liberty because I love it and it's easy to brush off the cat hairs!! I love the gypsy cushion you made. Having seen it I'd like to make one myself as I've just got into Meditation and I think a cushion like that would be perfect for sitting on whilst meditating. I enjoyed your book review! The Gypsy Cushion looks like a fun project! Love your gypsy cushion. I'd probably make one in shades of pink and white for my granddaughter. Great pillow. Unfortunately, pillows in my household are still in 'danger' from a 3 year old grand daughter and 2 dogs. Oh I think I would use some flowery fabrics in yellow, blue and white. 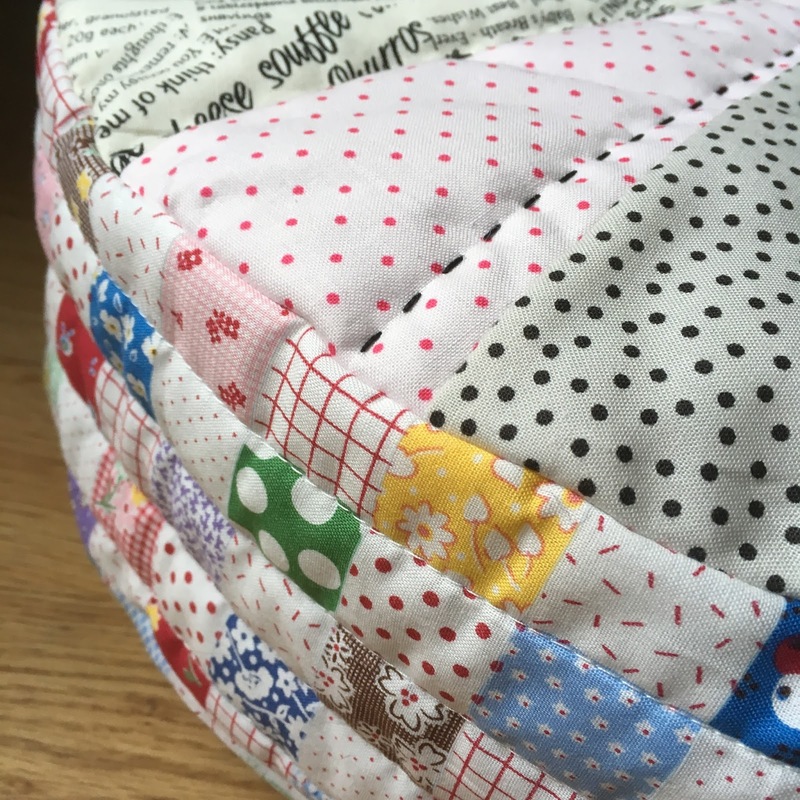 Love your pillow very much with the quilting! Kaffe Fasset or any Rowan fabrics would make a fabulous cushion! Your cushion is lovely! I haven't tried to make a circular one, before, but I would love to give it a try. I think I would make my cushion is blue and yellow, maybe a fabric line like Summer Breeze III from Moda? I would break into my newly bought stash of Kaffe fabrics to make this pillow! Thanks for the giveaway! I would use Katie Jump. Rope to make the cushion! I really love the cushion - you did an amazing job. I think that I would break out my coveted Friedlander fabrics and mix in some Japanese prints as well. Oh, how I would love to win the book!!!! P.S. I started your Stitchy Pie pattern last night .... it is so much fun! It will make the perfect gift for our new guild president. I'd love to make it with the same fabrics you used--love them! A pattern book that lays flat when it's open?! WAHOO!!! Gorgeous! I love your fabric choices and the handquilting. Great to have the templates the right size. A lovely cushion and great book review. I'm not sure if I'd make a cushion myself - no space on our sofa - but I'd love to try the quilt on the cover! I love Dresden plates and your pillow reminds me of one. I would love to use Mama Said Sew to make a pillow like yours. Thanks for the chance to win a copy of this book. What a lovely cushion!!! 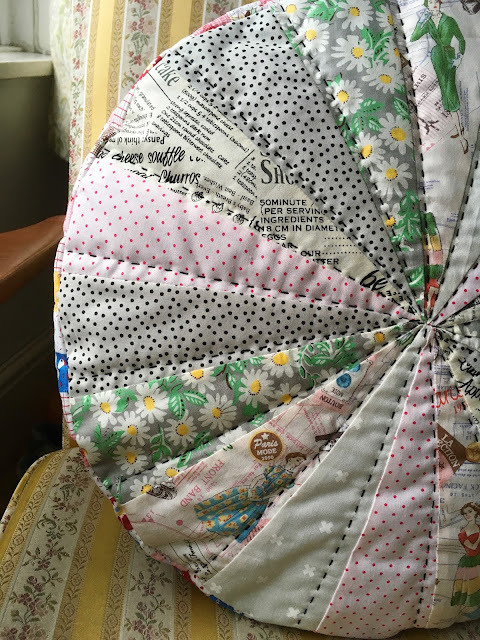 It seems so difficult to me sew a good round cushion. I love your cushion. How you ever got all those points to meet in the center without looking lumpy is beyond me!! Maybe that trick is explained in the book? You did a beautiful job! Lovely cushion. Thanks for the giveaway chance! I like the offset thick black quilting lines on your pillow! Thanks for the chance to win this quilting book! It's good to get full sized templates in any book or magazine. Love, Love your new cushion, its darling! I would pick a variety of small print fabrics for it. Good way to sort through the stash and use some of it up. Would be a fun gift for my daughter who is building a new home. thank you for the chance. Sounds like the book for me, I need a little quick and easy in my sewing room. I'm looking forward to seeing this book - it's not available in Canada yet ... but I'm planning on buying it for my guild library! OH love this with the hand quilting -- I think I would make it from my AMH stash! Look at me - reading a blog! Shock, I know. Love your cushion. I'd love to make a scrappy, rainbow version for little miss who has recently learnt to say (and identify) "rainbow"! Too cute. Well since I don't buy lines of fabric (all of my fabric is thrifted), I guess I would just make it out of totally random scraps! It's lovely. Thank you for a chance to win! I love your cushion and I love Erin's idea for a rainbow version! Shared on Twitter and Facebook! Love it! I would love use the book to for a quick and beautiful project like your cushion. The cushion would be great in Alison Glass fabrics! I also shared this blog post on FB! Love your cushion! It looks like a great book. The cushion is adorable with the big stitches, I would love to make that. Thanks for the giveaway. I think that pillow would be cute in 30's prints! I would love to win your giveaway. The Gypsy cushion is lovely - reminds me of a cushion my friend has, made many many years ago by her mother. 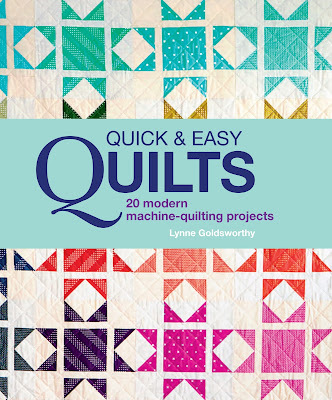 would love to win The Easy quilts book. I would use some bold florals to really make it gypsy colours. I would "sew" love to have this book! I would use Maureen Cracknells Fleet and Flourish fabrics, I would love to win this book! I would make one with my rainbow scraps. Love your cushion I would have fun trying to pick out fabrics, maybe make it for my son and do some yellows and blacks.